What do I need for my pet bunny rabbit? Now that you have decided on a pet rabbit you should have all supplies necessary before bringing it home. A bunny with a safe home, the correct food, and appropriate furnishings will be a happy and healthy pet. This care sheet will guide you in having everything you need. 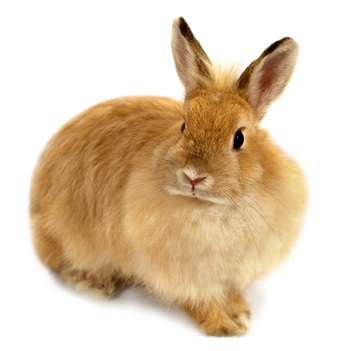 You will need a cage that is at least four times the size of your rabbit or an outdoor hutch at least 30 x 36 x 20 inches. Avoid wire mesh flooring and don’t use glass cages or aquariums. Always go with the biggest cage possible. Hay or straw is needed as a nesting area for outside rabbits. A litter box and litter for indoor rabbits. Paper based litter works best and do not use clumping litter. A water bottle or water bowl. Water bottles are easier to maintain. Food bowl for pellets and a feeder for hay. Your pet rabbit also needs toys and chew toys. Grass hay such as Timothy and alfalfa hay is an important part of your pets diet. Commercially available rabbit food pellets. Some occasional treats will always be welcomed by your rabbit. If you are unsure that your rabbit has a well balanced diet, dietary supplements are a good way to ensure you pet gets all the nutrients he needs. Brushes and combs for grooming, especially if you have a long haired bunny.